An explosion of interesting flavors in every single bite. Tangy, fresh, sweet, spicy. 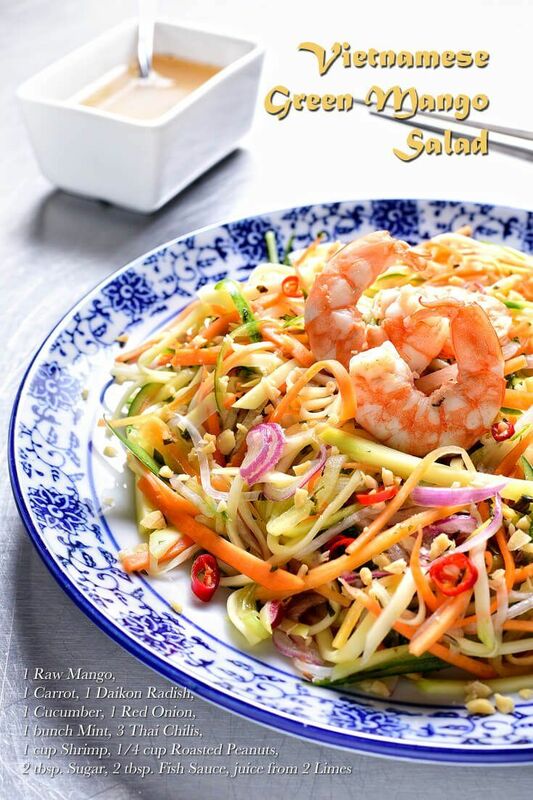 . . this Vietnamese salad definitely speaks Asian! A quick salad that's perfect as an appetizer or as a side for a simple fried or grilled main course. Definitely worth the try! Make a pickling solution. Whisk together 1/4 cup vinegar, 1/4 cup sugar, and 1/4 cup water in a bowl. 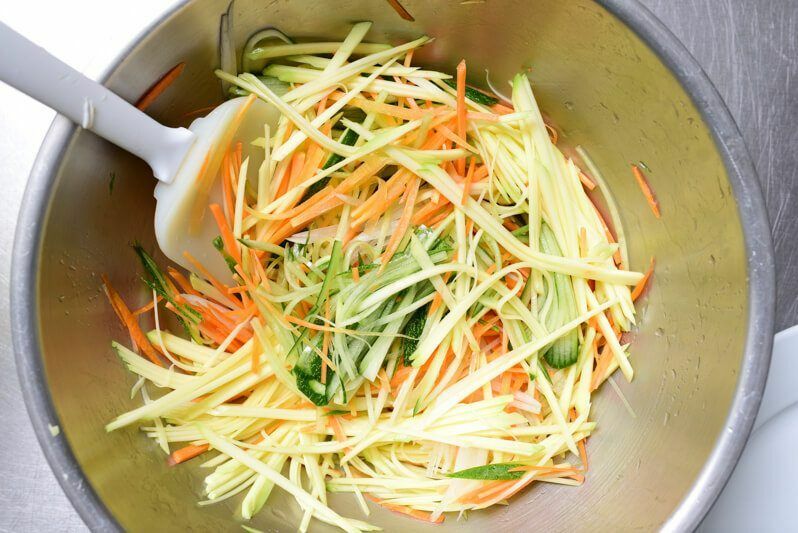 Toss the mangoes, carrots, daikon, and cucumber in the pickling solution and chill for an hour. 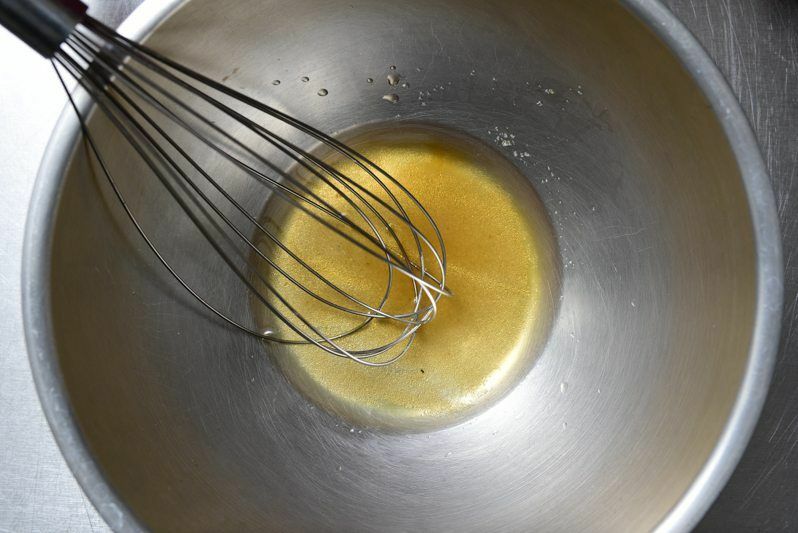 Whisk together the vinaigrette. 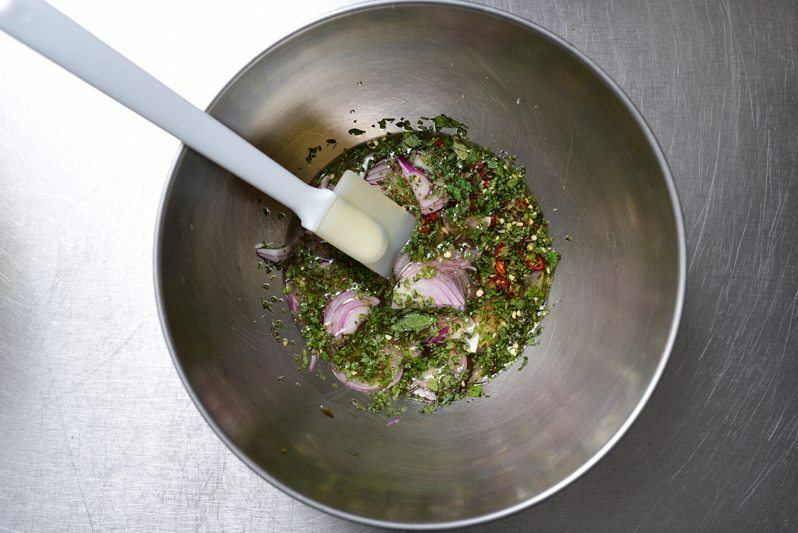 Combine the lime juice, fish sauce, 2 tablespoons sugar, chili, mint, and red onions in a bowl. 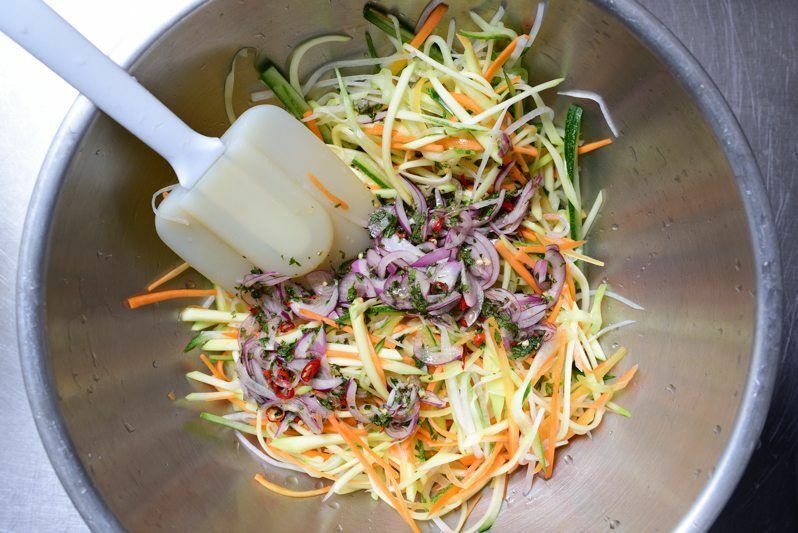 Drain the chopped vegetables from the pickling liquid and toss in the vinaigrette. Top with shrimps and chopped peanuts. 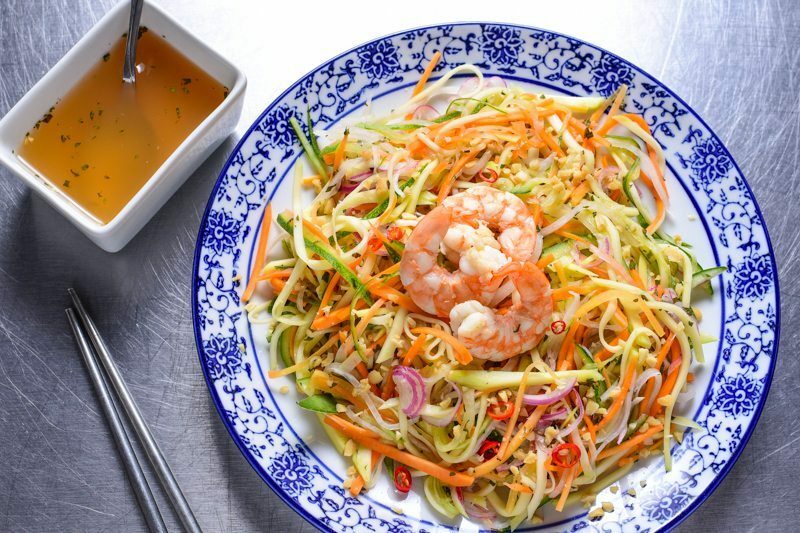 This Vietnamese salad shouts out nothing else but bold Asian flavors. Sweet, tangy, fresh, spicy. . . it indeed is a perfect representation of the complexity of most Asian cooking – hot and cool at the same time, flavorful yet easy to prepare. 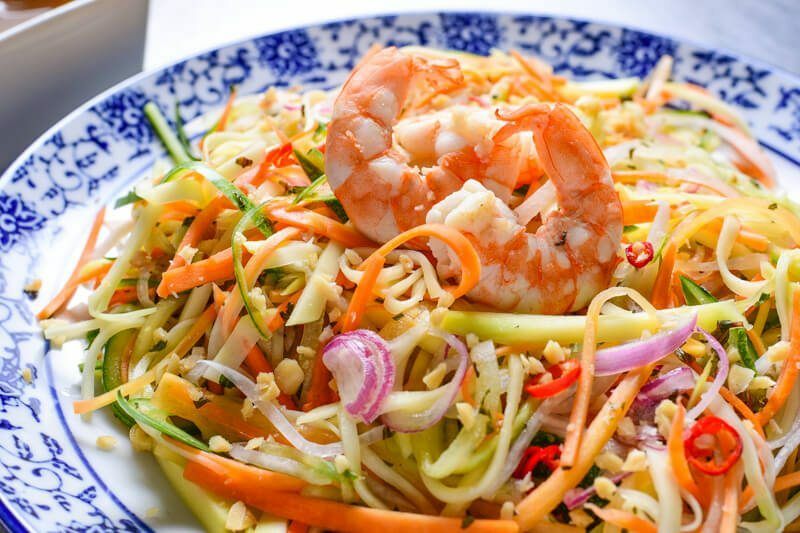 This raw salad basically is a slaw of crisp raw mangoes and an assortment of vegetables precisely cut into a thin julienne, making every bite a complete balance of both texture and flavor. 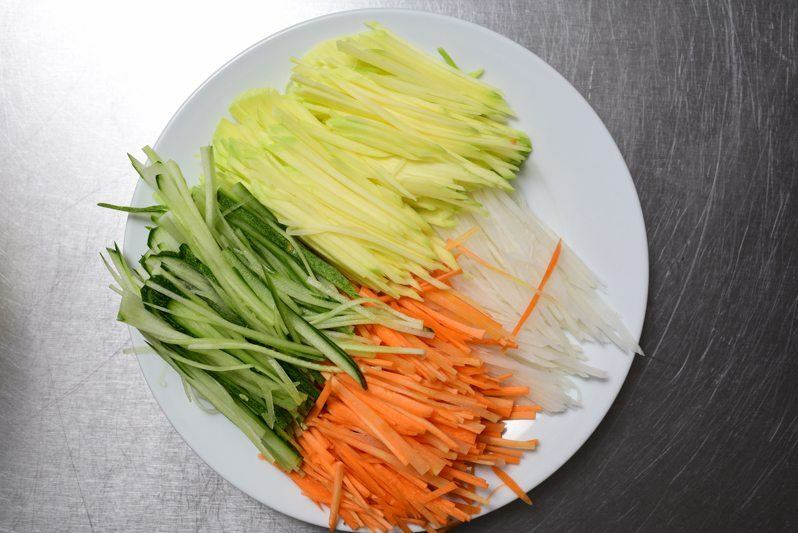 Being the only significant task you'll have to deal with in this recipe, it would be worth bringing your knife skills up to a bit of a challenge. As you'll see from the image below, I've used carrots, cucumbers, and some daikon radish in addition to the green mangoes. There would be nothing wrong with substituting these with some of your favorite vegetables, but you may want to consider these before doing so: carrots add a natural sweetness; the daikon adds a slight peppery flavor; the cucumber adds moisture; while those mangoes add tang and fragrance. The point is, do consider the properties and resulting play of flavors, with what you intend to include rather than randomly putting them into this mix. Worth noting would be to deseed those cucumbers. The excess water content from their core would thin out the vinaigrette and significantly dilute it into something less flavorful. These mangoes and chopped vegetables are going to need some brief pickling for some added moisture, flavor, to rid some of the bitter flavors, and to soften them up a bit. To make a basic pickling solution, simply mix together equal parts of water, sugar, and any acid component(vinegar or lime juice). Toss everything in this mix then cover and chill for about an hour. 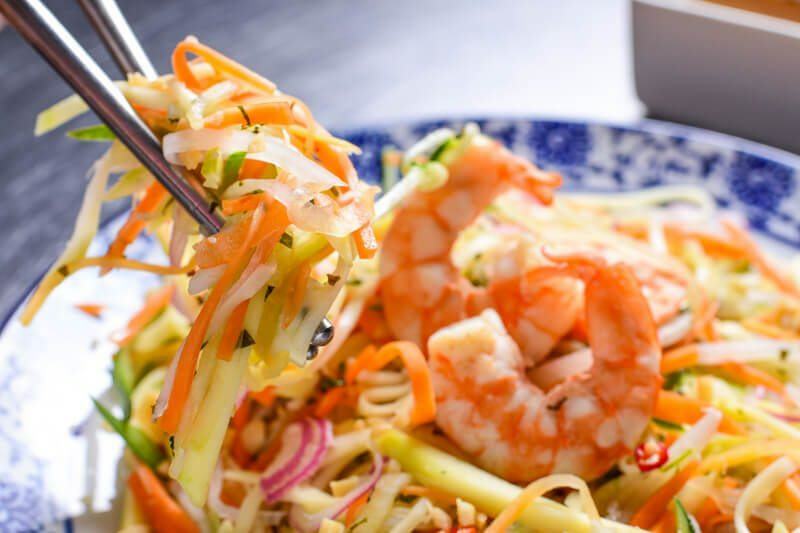 Meanwhile, let's prepare the vinaigrette that will give this salad its Vietnamese flavor. Mix together equal parts of water, lime juice, sugar, and fish sauce. Add in some thinly sliced red onions, chopped chili, and chopped mint. The proportions detailed in this recipe should be a good starting point, but do taste and adjust along according to your taste. Take the pickled vegetables out of the chiller, drain off all the liquid in the bowl, and toss everything with the vinaigrette. This salad should be good to serve immediately, though another 30 minutes in the chiller would bring all those flavors much better. All the effort you've put into meticulously preparing this dish will be rewarded with considerably one of the most refreshing salads you've ever had. Good on its own, with some protein component for topping, or as a refreshing side for some grilled fish or poultry. 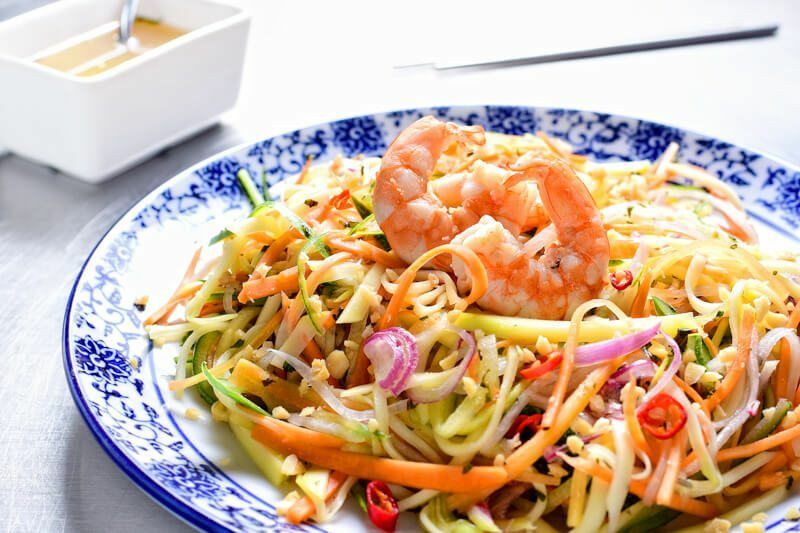 A few pieces of fresh blanched shrimps, some grilled chicken breast slices, or thinly-sliced roast beef tenderloin would be excellent suggestions to round up this salad. A good sprinkle of chopped roasted peanuts will also add more texture and another layer of flavor.